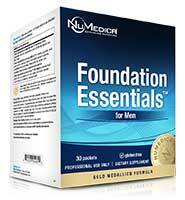 NuMedica Foundation Essentials + CoQ10 supports optimum bone health in specially designed daily dose packets for men. This powerful supplement contains daily doses of ingredients that enhance bone health. Bone loss is a gradual process that begins in adulthood. Bone loss occurs more rapidly as people reach age 50. NuMedica Foundation Essentials + CoQ10 provides the nutritional support people need to support bone growth and bone maintenance. 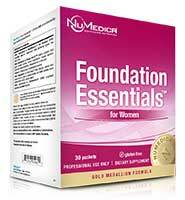 NuMedica Foundation Essentials + CoQ10 comes in two sizes: 30 packets or 60 packets. The larger size last twice as long and offers a savings of about 10%. View additional product images. NuMedica Omega 600 USP EC provides 600 mg of ultra-pure, molecularly distilled, natural marine lipid concentrate sourced from fish caught in cold, deep sea waters and is USP (United States Pharmacopeia) verified. NuMedica Coq-Clear 100 mg Ubiquinone is a patent pending, crystal-free CoQ10 that offers the highest absorption and bioavailability. 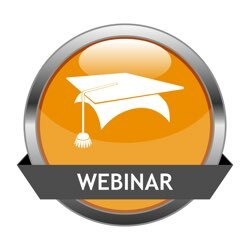 CoQ10 is a component of the electron transport chain, participating in aerobic cellular respiration for generating energy. Most of the human body's energy is generated this way. Coenzyme Q10 is a vital part of a high quality foundation nutrition regime, as an extremely powerful antioxidant. Nutritional supplements provide support for strong bones, bone mass, optimum bone density, and bone growth. Vitamins like D3 and other bone-building nutrients stimulate bone rejuvenation. Supplements are vital for supporting bone health as people age. Calcium, of course, plays a major role in the health of bones. 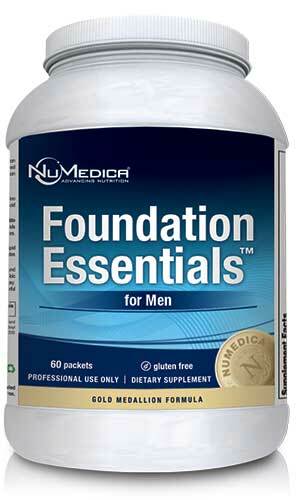 NuMedica Foundation Essentials + CoQ10 contains calcium along with vitamin D3 for calcium absorption. 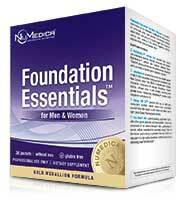 NuMedica Foundation Essentials + CoQ10 contains essential nutrients that support bone health. This supplement contains a comprehensive makeup of vitamins, minerals, herbs, and amino acids. Each packet provides a daily foundation for bone support and contains naturally occurring bone growth factors, phosphorous, magnesium, oils from deep sea fish, and powerful antioxidants. Foundation Essentials Men + CoQ10 - 30p 1 Packet 30 Take one packet 1-2 times daily or as directed by your healthcare practitioner. 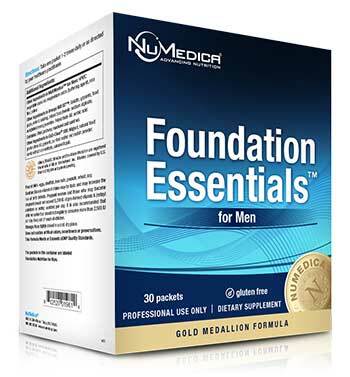 Foundation Essentials Men + CoQ10 - 60p 1 Packet 60 Take one packet 1-2 times daily or as directed by your healthcare practitioner. Other Ingredients in MultiMedica™ for Men: HPMC (vegetable capsule), magnesium oxide (buffering agent), magnesium stearate (vegetable), silica. Other Ingredients in Omega 600 EC™: Gelatin, glycerin, food glaze, enteric coating, mixed tocopherols, sodium alginate, ethylcellulose, food glaze, Polysorbate 80, sorbic acid, purified water. Contains: Fish (anchovy, mackerel and sardine). Other Ingredients in CoQ-Clear® 100: Natural food grade citrus oil (GRAS Certified), gelatin (bovine), glycerin, purified water, medium chain triglycerides, natural softgel color (red radish powder, carob extract concentrate, caramel liquid). Does not contain artificial colors. Caution: Excess vitamin A intake may be toxic and may increase the risk of birth defects. Pregnant women and those who may become pregnant should not exceed 5,000 IU of pre-formed vitamin A (retinyl palmitate or retinyl acetate) per day. It is also recommended that children under four should not regularly consume more than 2,500 IU per day. Keep out of reach of children. Daily dose supplement pack No Iron contains NuMedica MultiMedica No Iron, OsteoMedica, Omega 600 USP EC & CoQ-Clear 100 in 30/60 packet size. Daily dose supplement pack for Women contains NuMedica MultiMedica Women, OsteoMedica, Omega 600 USP EC & CoQ-Clear 100 in 30/60 packet size.